Sustainability is a constant awareness within the large format sign printing and plastics industries. The shear numbers in tons of plastic that pass through print systems will make your head swim; so, optimizing and saving every little bit helps– beginning with manufacturing. Extensive steps have been taken at UltraBoard production facilities to assure sustainable processes are in place to reduce and recycle waste materials. Essentially all UltraBoard foam core products contain 33% recycled materials. How Do We Recycle Foam Core? Reclaiming excess waste expelled during bulk foam core processing insures that virtually no foam is lost. Excess waste is converted to raw form and reintroduced into future foam extrusion processes. When transitioning between white and black foam cores during our extrusion process, the transition foam color is not useable. We can recycle this foam by utilizing it in products with foam cores that are not exposed display-side. 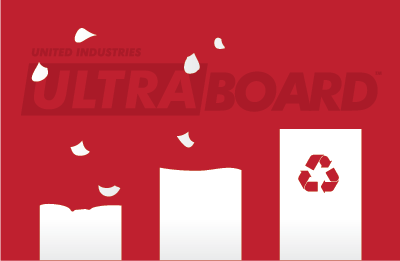 UltraBoard Classic is a completely plastic 100% recyclable foam core board. The material composition is thermoplastic, meaning that it can be melted down and reincorporated into newly extruded polystyrene products. UltraBoard is 100% recoverable via a process of grinding up the foam board and repelletizing it for reuse in the plastic extrusion process. This entry was posted in Commercial Signage, Industry News, Press Releases, Substrates and tagged recycling, sign recycling, substrates, sustainability, ultraboard.